Oceania Cruises combine the feeling of a country hotel and the sophisticated elegance with the adventure and flexibility of sea travel. Offering 5* ships with an emphasis on providing the ultimate in service, cuisine and quality, yet set in an un-pretentious casual country club atmosphere. Although families are welcome there are no facilities on board for children. 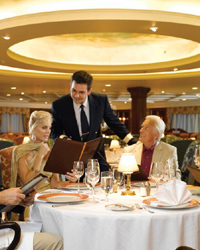 Dining is available in a variety of distinctive open-seating restaurants, all at no additional charge, and the evening dress code on board is elegant casual. 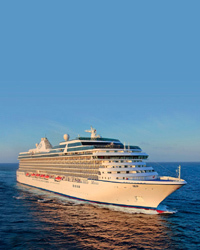 Oceania Cruises proudly offer a variety of exciting and exotic worldwide itineraries with extensive shore excursion choices and expert on board lecturers. The itineraries include more overnight visits and extended evenings in port so guests can really make the most of exploring a new destination. Currency on board is US$. Guests may adjust gratuities while on board at their discretion, as well as pre-pay them or have them added to your on board account. There is also a service charge for beverage purchases and spa treatments. Oceania offers its guests exceptional personalised service and extraordinary value to make your holiday a truly memorable experience.